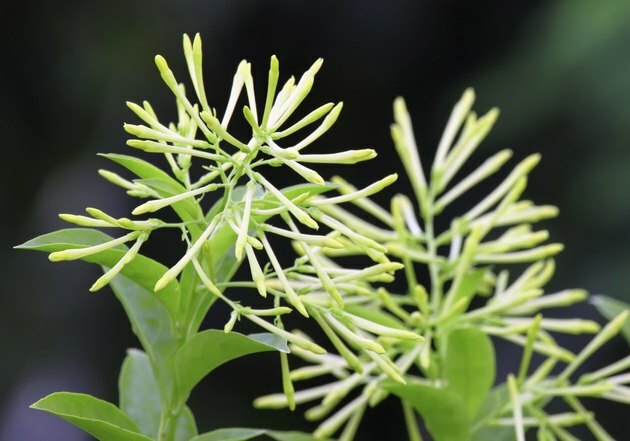 Like a Friday-night partygoer out on the town, night-blooming jasmine (Cestrum nocturnum) shines after dark. In daylight, its green foliage and greenish-white flowers fade into the background. As the stars come out, however, the tubular blossoms saturate the air with intensely sweet fragrance. The potentially invasive evergreen grows outdoors in U.S. Department of Agriculture plant hardiness zones 9 through 11 and as a houseplant elsewhere. Be warned: Eating any part of night-blooming jasmine is toxic to people, pets and livestock. NIght-blooming jasmine's tubular flowers give way to glossy white berries. Outdoor night-blooming jasmine does best in loose, well-drained soil. Fertilize before the new growth emerges in early spring, and again in early summer and early fall with granular, 15-15-15 all-purpose fertilizer. Spread 1/4 cup of the granules evenly around the dripline, where rain falls from the tips of the branches, and water it in. Night-blooming jasmine needs consistently moist soil, so water it slowly and deeply whenever the soil begins to look dry. Grown indoors, night-blooming jasmine needs a container with drainage holes and loose, rapidly draining medium. To water, wait until the soil looks dry, and then saturate it until water drains from the base of the pot. Fertilize weekly from late spring to late fall with 1/2 teaspoon of granulated 15-15-15 fertilizer dissolved in 1 gallon of water. During winter, feed with fish emulsion only if the leaves aren't a healthy green or the plant seems less vigorous. Mix 1/2 teaspoon, or half the label's specified amount, of emulsion per quart of water and use 1 cup for each 1 foot of the plant's height. Prune the plants lightly after each flush of bloom. To control their size, cut them back hard in late fall or before the new growth appears in spring. Pruning outdoor plants back to 3 feet from the ground isn't excessive. Night-blooming jasmine rewards heavy pruning with lush, abundantly blooming new growth. Use clean, sharp pruning tools rinsed between cuts in a solution of 1 part household bleach to 9 parts water, so you don't accidentally spread disease. Fungal and bacterial diseases seldom bother night-blooming jasmine, but a trio of sap-feeding insects generally makes a mess of them, indoors or out. Look for the pests congregating on the backs of the leaves, where spider mites spin fine webs. Aphids and whiteflies drench the plants with clear, sticky waste. Dislodge the mites and aphids with a strong water spray. Capture whiteflies with a battery-operated vacuum early in the morning when they're still moving slowly. Freeze the dust container in a sealed bag overnight before disposing of its contents. To control all three pests, spray the plants until all their surfaces drip with ready-to-use insecticidal soap. Although the soap is safe for indoor and outdoor use, wear gloves, protective clothing and eyewear and closed-toe shoes as a precaution when spraying.